Warm up your love life with satisfying and memorable coffeehouse moments. Join your spouse in smooth, full-bodied conversations that blend stimulating depth and a soulful connection. 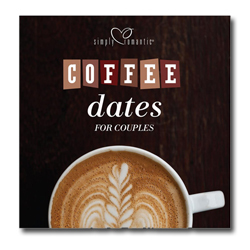 Coffee Dates for Couples provides refreshing conversation starters and flavorful date ideas. Enjoy the rich aroma of a robust, spicy conversation with your spouse in the haven of java!